and passed down the long hall until she came to Ralph’s door. She Stopped a minute outside and listened—but a deep silence filled the whole house. 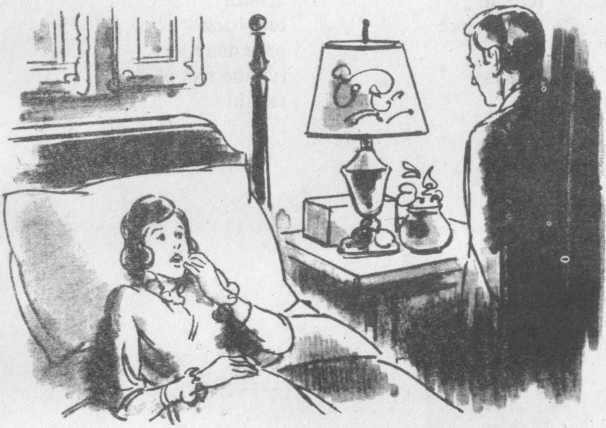 She opened the door with a hand as gentle as if she were lifting a veil from the face of the dead, and saw Mrs. Touchett sitting beside the bed of her son, with one of his hands in her own. The doctor was on the other side of the bed; two nurses stood at its foot. As Isabel watched, the doctor gently placed Ralph’s hand in its proper position at his side. The end had come. Ralph’s face had never seemed so fair as at present. It bore a strong resemblance to the face of his father, whom Isa­bel had seen lying here in this same way six years before. She went to her aunt and put her arm around her; and Mrs. Tou­chett, who usually showed little emotion, rose, as might be, to take it. She was stiff and dry-eyed; her face, though, was drawn and white. “Dear Aunt Lydia,” Isabel said. “Go and thank God you’ve no child,” said Mrs. Touchett, freeing herself suddenly from Isabel. his head higher than the rest—bowing it rather less. During much of the time Isabel was aware that Mr. Good­wood was looking at her—but she never let him see that she saw him. She thought of him only to wonder that he was still in England. She had taken it for granted that after accompany­ing Ralph to England he had gone away—probably to America. He was there, however, most certainly. And something in his attitude seemed to say that he was there with a definite inten­tion. Ralph had said to Isabel that he hoped she would remain at Gardencourt, and she made no immediate move to leave. She said to herself that it was her duty to remain a little with her aunt. This was as good an excuse as any, for she had no wish to return at once to Rome. She lived from day to day, postponing, closing her eyes, trying to think and not to think. She knew she must decide soon, but she decided nothing. Her coming to England had not in itself represented a decision. She had heard nothing from Osmond—nor did Pansy write—but that was simple: her father had told her not to write. Mrs. Touchett accepted Isabel’s company but offered her no help. She was rather busy, in her own practical way, with her personal matters—particularly those having to do with Ralph’s will and the settling of his estate. She had made known to Isabel very early several of Ralph’s arrangements. He had told her everything, Mrs. Touchett proudly explained, dis­cussed everything with her. He had left her no money, and of course she had no need of money. Gardencourt and most of its furnishings, pictures, and other works of art were to be sold and the money used to establish an institution for poor persons suffering from the same disease of which Ralph had died. Warburton did not even mention his coming marriage, though he did in­vite Isabel to come to Lockleigh and visit his sisters, who al­ways asked about her. He then left to catch an early train back to Lockleigh, and this was the last Isabel saw of him. Mrs. Touchett accompanied Lord Warburton back to the house, while Isabel remained in the garden, wandering about alone as before. Thus it was that she came at last to the same bench where, some years earlier, she had been sitting reading a letter from Caspar Goodwood when Lord Warburton appeared and proposed to her. The past came back to her in one of those rushing waves of emotion by which sensitive persons are often visited. The effect of all this was a sudden sense of being very tired, under the influence of which she sank down upon this same bench. How long she had sat there she did not know but soon she was conscious of the presence of another person. She looked up to see Caspar Goodwood standing a few yards off and staring at her. He had approached silently across the lawn. It occurred to her that in just this same way Lord Warburton had surprised her long ago. A. 1. What did Isabel believe that she saw the next morning? 3. What did Mrs. TouChett do when Isabel tried to show her sympathy? 4.Who were some of the people who attended Ralph’s funeral? 5.What did Isabel think about Mr. Goodwood during the funeral? 6.What excuse did Isabel make to stay on at Gardencourt? 7.Why hadn’t Pansy written to Isabel? 8.What arrangements had Ralph made about his estate? 9.What did Isabel do to pass her time at Gardencourt? 10.How did Lord Warburton behave toward her? 11.Where was she sitting when Caspar came up to her? She immediately rose, and as soon as Goodwood saw that he was seen he started forward. With a movement that was al­most violent, but felt like—she knew not what, he took hold of her by the arm and made her sink again into the seat. He said nothing at first. She only felt him close to her—beside her on the bench and pressingly turned toward her. It almost seemed to her that no one had ever been so close to her as this. “You’ve frightened me,” she said at last. “How can you help me?” Isabel asked in a low voice. She felt very much afraid, yet she listened to him as never before— as to a voice in the darkness from which there might come some relief. She turned on him as if he had struck her. “Are you mad?” she cried. Goodwood seemed to pay little attention to her words, but went right on. “I have never been more sane,” he said. ‘To get away from you,” Isabel answered. But her words expressed only a little of what she felt. The rest was that she had never been loved like this before. This was the hot wind of the desert, at the approach of which the others dropped dead. Goodwood pressed on, his words seeming to pound into her ears. “Why shouldn’t we be happy?” she heard him saying to her, “—when it’s here before us, when it’s so easy? I’m yours forever—for ever and ever. Here I stand; I’m firm as a rock. You must save what you can of your life. You mustn’t lose it all, simply because you’ve lost a part. You took the great step in leaving Rome. The next is nothing—it’s a natural step. What is there that holds us, what is it that has the smallest right to interfere in such a question as this? Were we both bom to suf­fer—were we born to be afraid? I never knew you to be afraid. Be mine, and I’m yours.” He looked at her, and the next mo­ment he had thrown his strong arms around her and pressed his lips upon her lips. His kiss was like white lightning, a flash that spread and spread again through her whole body, and stayed. Isabel struggled to free herself. “As you love me, as you pity me, leave me alone. I beg you to go away,” she said. She spoke, however, more to hear herself say something. She felt that she must resist. She had wanted help, and here was help. It had come in a great rushing wave. Yet it was difficult for her to know what to do. She believed just then that to let him take her in his arms again would be for the moment at least the next best thing to dying. This belief was a kind of rich emo­tion in which she felt herself sink and sink. Yet some other emotion even deeper within her made her push him away. She felt somehow ashamed—she needed time to think. She turned suddenly and ran from the spot. There were lights now in the windows of the house. They shone across the lawn. In a very short time she had reached the door and here she paused. She looked all about her, she listened a little, then she put her hand on the door to open it: She had not known where to turn, but she knew now. There was a very straight path ahead. Caspar Goodwood was not looking at her. His eyes were fastened on the doorstep. “Oh, she started—?” he mumbled. On which he looked up at her—but only to guess what she meant. Yet her expression gave him some comfort, and it added, on the spot, thirty years to his life. She then walked him away with her, as if she had given him the key to the situ­ation and the patience to wait. A. 1. What did Goodwood do when Isabel rose from the bench? 2. Why had he been waiting and walking around for some time? 3. What had Ralph said to Goodwood? 4. What did Goodwood say was wrong with Isabel? 5. What did Caspar say and do? 6. How did Isabel feel about his kiss? 7. Why did she turn and run into the house? 8. What did Goodwood learn from Henrietta? 9. What hope did Henrietta give him?